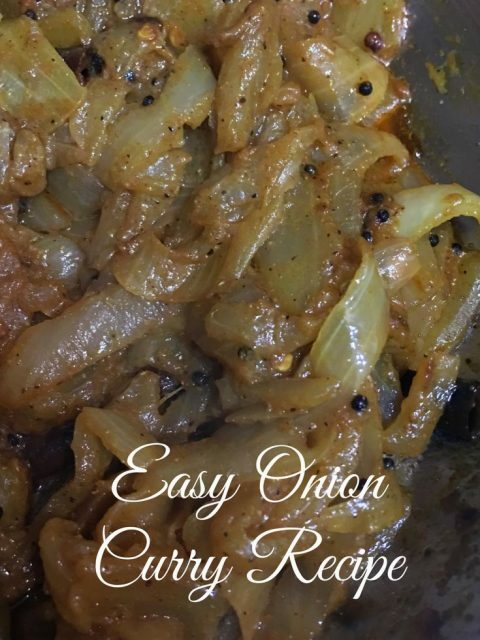 This easy onion curry for chapathi and poori or simple Indian style onion fry recipe is made with onion as the main ingredient and a few spices to add flavor to the cooked or sauteed onions. 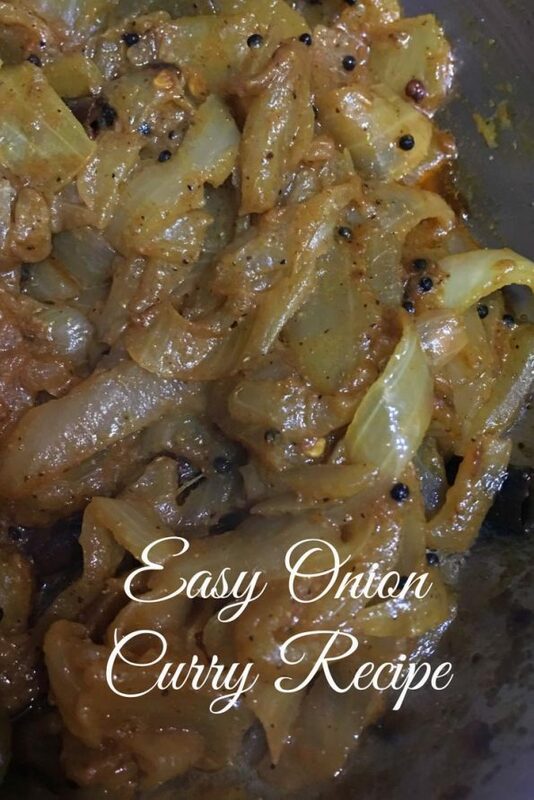 This onion curry recipe is very simple and basic and you can adjust the recipe to vary the spices used and also make this with gravy or without gravy as you like. Just make sure to saute the onions enough, as the curry will taste best with well sauteed onions (browning or caramelizing is the best but that is not necessary). This onion curry is vegetarian as well as vegan curry which you can easily prepare at home, and it is delicious too with very simple and easily accessible ingredients. This is an easy onion curry without tomatoes as well, and as I mentioned, you can make it with or without gravy as you like. So here is how you can make this easy and simple Indian style onion curry for chapathi and poori following this simple Indian onion curry recipe without tomatoes. This recipe for simple and easy to make onion curry for chapathi and poori is very flexible and you can adjust the spices as per you liking. Peel and slice the onions evenly in long slices, keep this aside. To prepare the seasoning, heat oil in a pan (or use an iron skillet or a kadai for better results), and add mustard seeds. When the mustard seeds starts spluttering add curry leaves, red chilies fry for a few seconds. Add the crushed garlic and ginger, saute for 1 to 2 minutes. Add the onions and salt, mix well, and saute the onions for few minutes until the onion starts browning or turns transparent in color. You don't have to caramelize the onions, but the the flavor of the dish will increase if you saute it for more time. If you are in a hurry and want to do it even more quickly, you can add the water and when it starts boiling, reduce the flames and let it cook for about 3 to 4 minutes. keep stirring in between to avoid burning at the bottom of the pan. If you are adding the water, it will help you to cook the onions more easily. However adding water is not necessary, as you can just make this onion fry using oil by sauteing few more minutes in the oil. Once the onions are almost browned and cooked enough to your preference, add all the spices and mix everything well, let the onions get blended in the spices for about 2 to 3 minutes more. Now the onion curry is almost ready, just see if the water is all absorbed or if there is still water in it ( (if you are adding water). Now the onion curry or onion fry is ready to be served, enjoy with chapathi or poori as you wish! This onion curry do not need any gravy, however you can either add more water if you wish to have some gravy or you can wait till all water is absorbed. Its all your preference and I usually make this onion fry without any gravy. I recently updated the recipe to include more servings and I updated the part of adding water to specifically mention that adding water is totally your preference. As I mentioned in the instructions, adding a little water will help cook the onions much more faster, but personally I prefer the texture of this onion fry much more when its made without using any water. You can use an iron skillet or kadai to make it more delicious. Also the recipe is very flexible so you may adjust the spices based on your preferences. If you are looking for tomato onion curry, you can find the recipe here. I also have an easy recipe for onion tomato fry here. This is a simple South Indian onion curry without tomatoes, which can be prepared so quickly and enjoyed as a simple side dish with chapathi, poori or bhatura. This onion curry or onion fry also makes great side dish with parathas including Kerala style malabar paratha (parotta). We use garam masala powder and ginger & garlic along with other spices to make this easy onion curry easy and delicious. You can also use ginger garlic paste instead of using fresh ginger and garlic separate. If you are a reader from India, you can buy garam masala powder here and ginger garlic paste here. This Indian style onion curry is so simple and easy to prepare yet delicious when served with chapatis as a side dish. You can easily make this in no time, as this is a very quick and super simple onion curry recipe for chapathi or poori. This simple onion curry for chapathi can also be used with other dishes like dosa or rice, but it will pair more nicely with sandwiches as a great filling ( if you cook till all the gravy is absorbed). This onion curry uses just onions and spices along with some crushed garlic, so this is an onion curry recipe without coconut (I specifically say this because many of my recipes, especially curry recipes are based on coconut gravy blended with spices) and definitely not without onions or garlic ( I have posted a tomato curry for chapati in blog which is also a curry recipe without coconut but it is a no onion no garlic curry too). This is a simple and easy onion curry without tomato/tomatoes too. As I already mentioned above, I have more onion based curry recipes in my blog which are great to be used as side dishes for chapathi, which includes tomato onion curry for chapathi, onion tomato fry Kerala style recipe etc. See the pictures of those recipes too below. 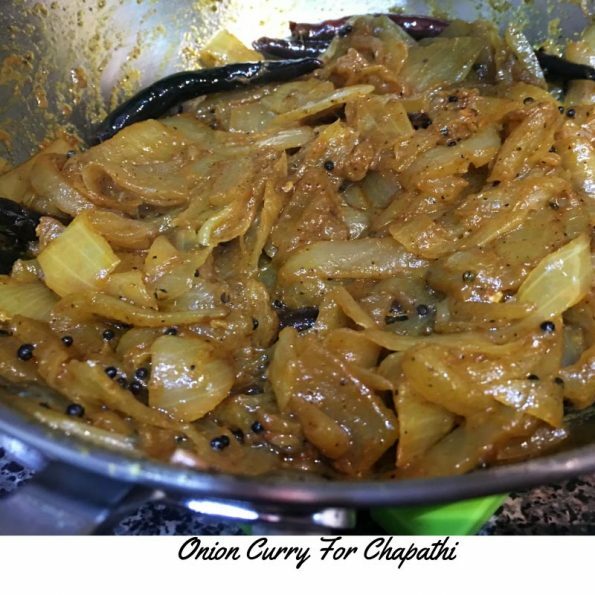 However, coming back to the onion curry we discuss here, this onion curry for chapathi is the most simple onion curry for chapathi you can prepare as we only has onion and spices as the main ingredients. You can quickly and easily prepare this curry for chapathi just using onions and spices. Also you can adjust the spices based on your preferences. I strongly recommend using garlic and ginger along with spices as they add much flavor to the recipe. You can either use ginger garlic paste or use freshly crushed garlic and ginger for the preparation of this dish. Instead of freshly crushed garlic, you may also used garlic powder if you wish. The onion curry is somewhat spicy, and you can make this more spicy by adding more red chili powder or chopped green chilies, but this curry is already spicy with red chili powder, crushed ginger and black pepper powder. If you do not want the onion curry to be spicy or just mildly spicy, skip either red chili powder or black pepper powder or reduce the amounts or skip both, as you wish. The onions are sauteed and spices are added to make this simple side dish for chapathi & poori. I recommend lightly frying the onions until they are transparent or lightly browned for best results. As you saute the onions for more time until they are browned, the taste of this dish will increase, however it is not necessary to brown the onions, you can just saute them until they look transparent in color and use little water to cook the onions if you are in a hurry. See recipe instructions and recipe notes for more directions on this. Hope you found this post on Indian style onion curry for chapathi and poori helpful in making easy and yummy onion curry.